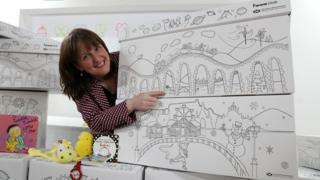 A new design of baby box depicting the changing seasons will be delivered to Scotland's parents next month. Illustrated by school pupils, the print incorporates Scottish landmarks such as Ben Nevis, the Glenfinnan Viaduct and Edinburgh Castle. The new box will also include a voucher for a reusable cloth nappy and liners from Glasgow-based company Tots Bots. More than 80,000 baby boxes have been distributed with uptake increasing to 96% in the third quarter of 2018. The first of the new boxes will be handed to parents on Monday 1 April. The theme of the design is the four seasons, representing change and the journey from birth to adulthood. It also pays homage to notable moments in Scottish history, with illustrations of Dolly the Sheep, the steam train, modernised by James Watt, and a bicycle - a nod to Scottish inventor Kirkpatrick Macmillan. Free space was left around the trunk of the tree on the lid to allow families to add their newborns' hand and foot prints. The new design was chosen through a Young Scot competition, celebrating the Year of Young People in 2018. The winning pupils were Demi Burnett, 12, from Banff Academy in Macduff, Edith Macdonald, 13, from the Community School of Auchterader in Gleneagles, Emily Wilson, 15, from St Luke's High School in Barrhead, Holly Henry, 16, from St Columba's in Kilmacolm and Sonny Robertson, 17, from Trinity Academy in Edinburgh. The five received an award from Children's Minister Maree Todd at the APS distribution centre in Leith where the boxes are printed, filled and sent out to expectant parents. Ms Todd said: "This new design - by children for children - is impressive in its detail and creativity. "Parents have also told us that they love personalising their Baby Box, and as a result my favourite idea from the winning team is the free space left around the trunk of the tree on the lid to allow the family to add their newborns' hand and foot print. "It will touch the hearts of many parents that children from across the country have worked together, investing so much time and effort, into creating something truly special for their babies." The Scottish government launched the baby box scheme in 2017 when uptake was at 85%. Items inside included a selection of clothes from newborn up to the age of six months, a bath towel, a travel changing mat, muslin cloth squares, a bib, a number of books and a digital thermometer. The cardboard box also doubled as a bed - although experts raised questions over how safe they were to sleep in last year. A total of 80,873 baby boxes have been delivered since the concept was launched. Louise Macdonald, chief executive of Young Scot, said: "It is wonderful that a new generation of young Scots will be welcomed into the world with a beautiful Baby Box designed by today's young Scots. "I am delighted that 100,000 of these boxes will spark joy in households across the country over the coming years, and I thank every young person who has been involved in their creation." Jackie Brock, chief executive of Children in Scotland added: "The quality, creativity and skill shown by all the children and young people who entered the design competition was breathtaking. "Each submission demonstrated what a great opportunity the Baby Box provides for showing what is special about being born and growing up in Scotland. "Families will be really delighted with this addition to their baby's welcome. Once the baby and their friends are old enough to colour it in, it will make a wonderful toy and memory in future years." Video What's inside Scotland's baby boxes?